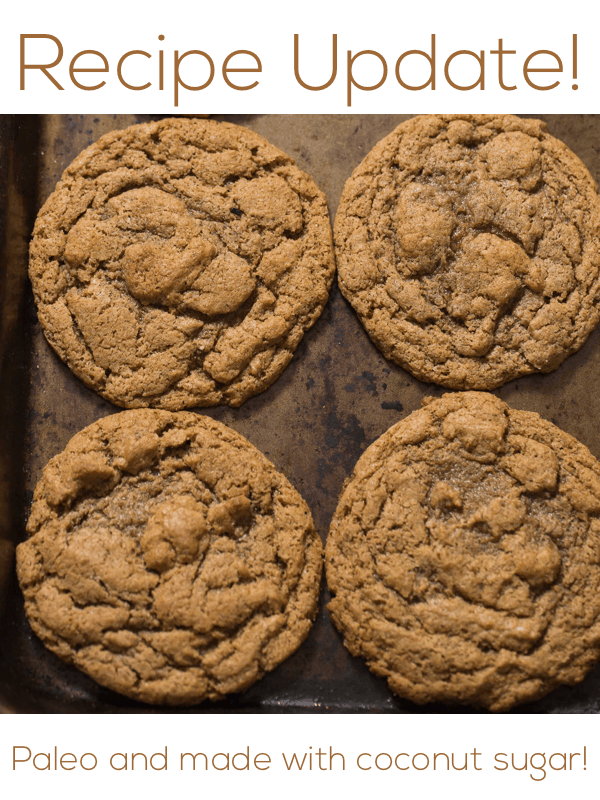 ***I’ve made an even healthier version of this cookie – Paleo Almond Butter Cookies! *** Did you all spend the last few days watching Fuller House on Netflix? Good. Me too. Full House was my favorite show when I was little. My sister and I would watch them every Friday night. Which is why I was SHOCKED when Shawn told me he had never seen an episode. Huh? I started recording all the old episodes, which are on Nick at Nite. Followed by Friends reruns. Which makes me feel so old. When I was little, Nick at Nite was for I Love Lucy and The Mary Tyler Moore Show. Now it’s my childhood shows. But hey, I’ll take it. Now, when the baby goes to sleep at 8, Shawn and I will stay up and watch a few episodes together. They’re just as good as I remember. It’s interesting watching it back now as a grown up and a mom. Those 3 guys did a great job raising those girls. Shawn loves them too. It’s like reliving 1993 all over again. 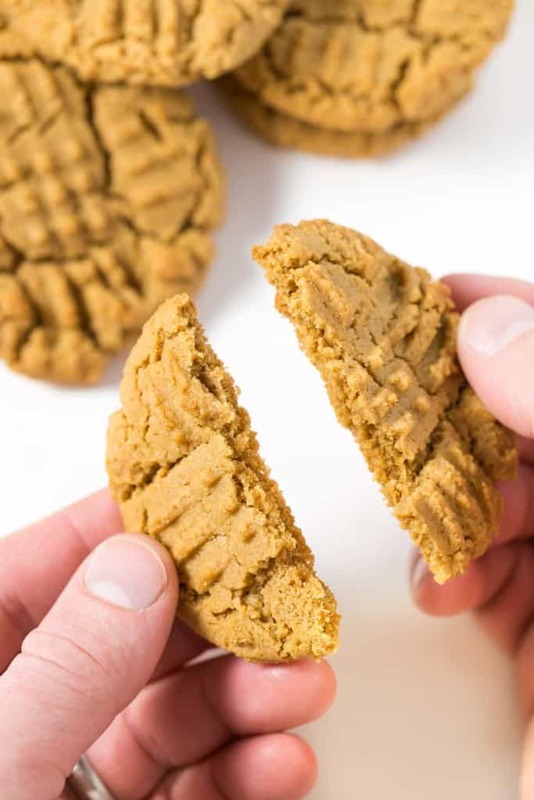 To make our TV watching even more enjoyable, I’ll make us a fresh batch of these dairy free peanut butter cookies, which are currently my absolute favorite cookie to make. 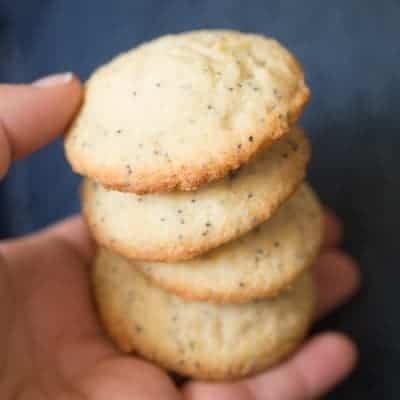 They are so delicious, and couldn’t be easier to make! Just 6 ingredients: peanut butter, white sugar, brown sugar, vanilla, baking soda and 1 egg. All things I am sure you have in your kitchen right now. And yes, you read that right. No butter. No flour. The peanut butter has enough fat to do just fine without them. I was skeptical at first, but now I am a convert. 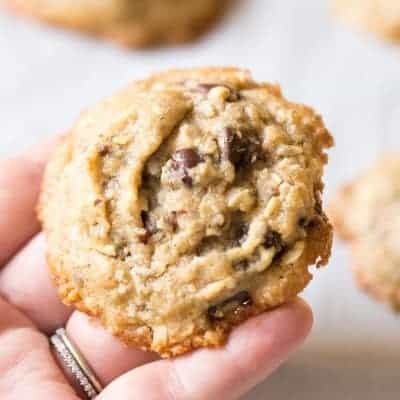 I love this cookie recipe because it really is easy and fast to make. No stand mixer, no chilling the dough, no waiting for butter to soften. 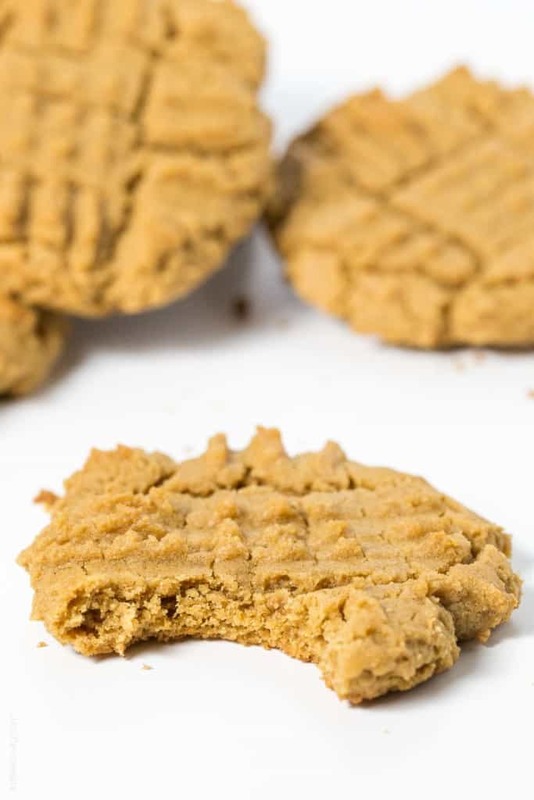 At any point in the day, you are less than 30 minutes away from freshly baked dairy free peanut butter cookies. Just throw the 6 ingredients in a bowl, stir, scoop, press them with a fork to give them that signature criss-cross pattern, bake, enjoy. It’s actually TOO easy. 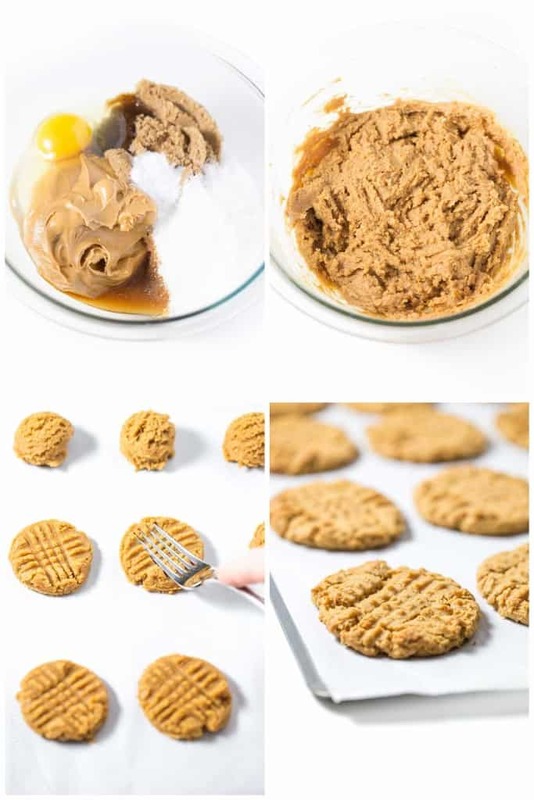 I’m not kidding when I tell you I’m making a batch of these dairy free peanut butter cookies every other night. It’s becoming a problem. We’re going through 2 gigantic tubs of Skippy peanut butter I get at Costco a month. Preheat oven to 350 degrees with the oven racks in the upper and lower third. Line 2 cookie sheets with parchment paper. Use a medium size cookie scoop to scoop out the dough (1.5 tablespoon size balls). Put 9 cookies per sheet. Use a fork to make cross hatches on top of the dough. Bake for 8-10 minutes, until the edges are set and the centers are slightly puffed up. Rotate the cookie sheets half way thru baking. Cool on the cookie sheet for 5 minutes before eating. 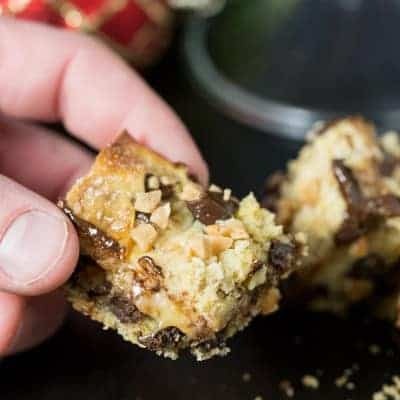 -This is the cookie scoop I use and love! 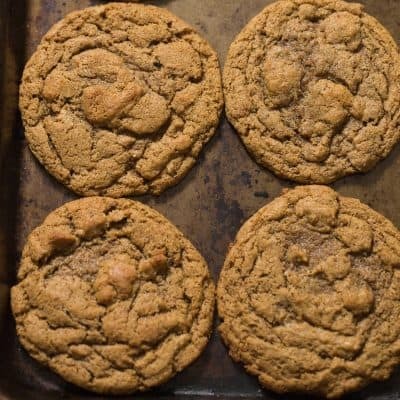 -I have an even healthier version of this cookie made with coconut sugar! See my paleo almond butter cookies for the recipe! Oh my gosh, Nick at Nite was my favorite when I was little! I remember one summer they had a thing called “block party summer” where they would show episodes of all the classics every night of the week. I loved Bewitched and I Love Lucy. Now nick at nite just isn’t the same anymore…is it even called that anymore? And I can’t WAIT to watch Fuller House…and yay for season two coming out! These cookies look SO good! Love that it’s just one bowl and a few ingredients! My sister and I would stay up late in the summer watching Nick at Nite. It was the only option! And yes, Bewitched! Didn’t you want to have magic powers like Samantha? You’re going to have such fun watching Fuller House, it’s super cute. 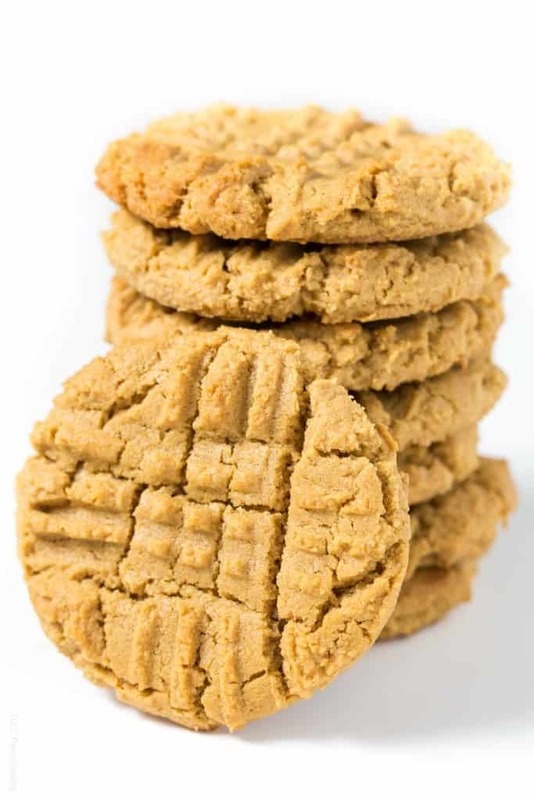 Peanut butter cookies are a total childhood favourite of mine. Loved when my mom would make those. And these ones look perfect! I haven’t watched Fuller House yet, but I loved Full House too, so I’ll have to watch it! Thanks Stacey! 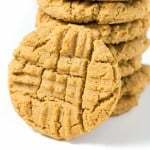 I can’t get enough of these peanut butter cookies. Mmm! You are going to have such fun watching Fuller House, it is super cute. These are awesome.. I made them with almond butter super tastey.. Love that they are Gf..
I’ve made them with almond butter too! Glad you liked them Jennifer! Can I use chunky peanut butter? Mmm I’ve made a similar recipe before, and they’re SOOO good. Without the butter and flour, all you taste is peanut butter, which is a BIG plus in my book :) I want to grab one out of the screen! And that’s so fun that Shawn and you are watching Full House together. I can’t believe he had never seen it! Yes, tons of peanut butter flavor! You’re so right. I just love them. And I can’t believe he had never seen it either! It’s a childhood essential! You’ve gotta check it out. It’s so cute! And thanks! I made another batch last night. And ate 4. Gah! Quick and with on-hand ingredients? Count me in! My husband doesn’t like peanut butter, oddly (I know — what’s wrong with him…), but that just means more for me. :) My parents binge-watched “Fuller House” this week and said it was really cute, so I might have to cave and finally get a Netflix subscription. I feel old admitting I don’t have one! ;) I still pay for cable! Haha. I really like them too! I’m having so much fun watching them. I like that there are a few more “adult” jokes in them. Excited they picked it up for season 2! And I do love that you don’t have to chill this dough. The faster I can cook and eat my cookies the better! The original Full House was definitely before my time, but I’m still loving the new Fuller House! I should probably go back and watch the older ones sometime! ;) And these cookies? GAH, how much more guilt-free and gorgeous can a peanut butter cookie get?? These look like excellent little milk dunkers! Full house was just a litttttle bit before my time. It’s funny, because the Olsen twins are only 4 months younger than me. Whenever I watch an episode, I think how I was their same age doing the same things when these episodes came out. My sister and I were really in to the reruns though. And yes, these are great milk dunkers! I just finished all of them! So fun! Really glad there is going to be a season 2. Thanks Kelly! Hey Natalie, how can these cookies be dairy-free using 1 egg? What do you think eggs are? Can’t even eat eggs either because they are “Dairy”! Where can I get truly dairy-free recipes? Eggs are not dairy :) Things that are dairy have to come from milk. Eggs are technically poultry. People just think they’re dairy bc they are in the same part of the grocery store. I want to try these but i’m going for a vegan style so no eggs. I just want to try it because my girlfriend is border line vegan and I need some recipes in my repertoire. i can use a 1/4 a cup of applesouce or bananas for the 1 egg substitute. It may have a slightly different taste but i’m sure it will still come out great for her. I am game anyway besides I like to cook. This should work with a vegan egg substitute. I know a flax egg works really well for most cookies. I’ve never tried that with this, but I would imagine it would be the way to go since it shouldn’t change the taste. If you try any will you let me know how it turns out so I can share it with others? You’re such a great boyfriend making her vegan cookies! These are delicious. I use natural peanut butter but its the creamy type (bjs and whole foods brands so far) and they both have worked wonderful. I love that they take 10 minutes and are a perfect sweet and peanut combo! Stumbled on this while looking for lactose free cookie recipes for my father-in-law. I think this is same or very similar to a recipe I used as a young poor mom. It was on C & H Sugar Box. Will put these in his (late)Christmas Box. I know he will Love them. Thanks for the Post! Wow! These are shockingly amazing cookies! So quick and easy! They also have a bit of protein so they are healthy, right?! Lol…Thanks so much! hi! I made these and loved them. I’m wondering…what is the caloric intake for one cookie? Thank You so much for this recipe!!! I am allergic to Dairy…These were delicious, speedy, and simple! I’ll have to check out some of your other recipes! Delicious! I have to really control myself on these. Thanks for the recipe. Thanks for the amazing recipe! My hubby has had major GI issues for years, and we finally saw a specialist who has recommended a 3 week elimination diet… 1 week no sugar, 1 no wheat, and one no dairy to see if his symptoms continue. 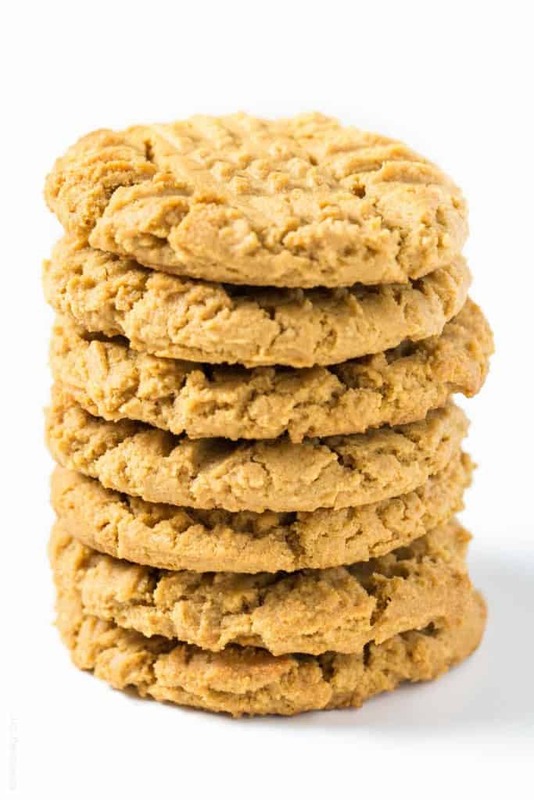 He picked dairy elimination for his first week, thinking it was the easiest… but his favorite peanut butter cookies contain dairy (He eats them all day every day lol)! But your recipe is delish, and we loved reminiscing about Full House… we’re both about between DJ and Stephanie’s ages lol, we just downloaded episodes to munch your treats and reminisce!!! Can these be made with coconut sugar? Yes! Use the same amount. I’ve made them with coconut sugar and they’re still amazing! I’ve made these twice THIS WEEK! TWICE! They are SO good. I made them basically as described only I used my convection oven and didn’t have to rotate during cooking. Thank you for sharing these! They are made with ingredients we always have in the pantry, they go together quick and are GF. It’s basically the perfect combination! I’ve never tried it, but that should work. I’ve also made these with coconut sugar if you’re trying to avoid refined sugar! Works great! i just made these cookies and they are everything you said they would and more!!! Thank you so much for sharing. Yea! So glad you liked them Tiffany! Thanks for letting me know you liked my recipe, you made my night! If I halved the sugar, would these cookies still work? Coconut & I don’t get along so the alternatives recipe wouldn’t work for me. Please let me know. Thanks! I’m not sure. The cookies might be a bunch runnier without the coconut sugar to help bind them. What about maple sugar? I get granulated maple sugar on Amazon! So glad you liked them Chris! You just made my day! You made my night! I was honestly not having so good a night and these cookies turned it around, complete 360. Thanks again! I’ll definitely be sharing this. I’m so glad you liked it Lisa! You made my day! They didn’t work at all, but the end result still tasted great! Sorry to hear that! What didn’t work? What peanut butter did you use? Yum. Just made these *almost* exactly according to the recipe and they are delicious! The only change I did was to use a little bit of Stevia in place of some of the granulated white sugar (no reason other than that I’ve been experimenting with Stevia sometimes). I filled my 1/2-C measuring cup about 2/3 full with white sugar, then the rest of the way with Stevia. Thanks for taking the time to let me know you liked my recipe! You made my day! Thanks Kara! I’m so glad you liked them! And what a great friend you are, bringing a new momma some cookies! My first baby had allergies to dairy, which is what got me started on going dairy free. This just really made my day, thanks for taking the time to let me know you enjoyed my recipe! These cookies are the best that I have had in years. My husband agrees! Yea! I’m so happy to hear that! Oh my goodness, you just made my day! Thanks for taking the time to let me know you liked my recipe. Always wonderful to hear! Thanks for sharing! They have a nice shelf life too! My friend recently had to cut dairy from her diet and I’ve been GF for several months. So I was hunting for something tasty we could both eat! I came across your recipe and knew this was the one to try. These cookies hit the spot! I’ve made them several more times. I found that if the mix isn’t firm enough I can just add a bit of cocoa or cacao power and it firms them up so nicely. I’m making them again to bring to a potluck tomorrow 😉. Thanks! I’m so glad you like them Audrey! This perfect is the perfect dessert for dairy free and gluten free diets. I love that you added cacao powder! I bet that’s so yummy. I’m going to try that next time! Thanks for taking the time to let me know you liked my recipe. Made my day!